Over time, parts of your automated garage door will become damaged either due to rusting, wear or even breakage. If any of these happens, we have the solution. Our team offers professional repair and replacement services geared toward restoring your door back to normal and optimum functioning in no time. When you arrive home, most expect to push the 'open' button and see their door open immediately, right? It is rarely expected that the opener simply fails to function. Unsurprisingly, as many openers last for a long time, you may even forget that it's there, making much of your door system's operation possible. However, as is the nature of these electro-mechanical components, it will wear out at some point when it reaches the end of its lifespan. When it does, don't take the risk of causing further damage with all the wires involved in the repairing process - our skilled experts will handle it for you in the safest manner possible. 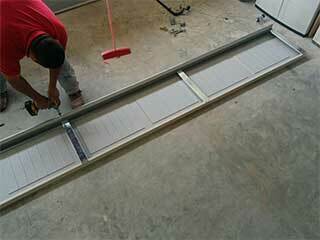 Rollers are responsible for the smooth operation of the door. Sometimes they can be a nuisance, causing a squeaky noise each time you open the door. This happens when they wear out and begin to wobble, jumping off track from time to time. If you’re experiencing this along with broken roller wheels, our team has you covered. Metal doors are highly likely to suffer dent-ins over time. Since the panel represents part of your home’s exterior, you should do something about it. Dents that are minor can easily be repaired by straightening them out - it may not be necessary to replace the whole thing. If it’s beyond repair though, replacement of the dented panel can be more straightforward than you would expect. We can take care of both the repair and replacement of your panels. Our experts at Garage Door Repair Beverly Hills are determined to provide you with the very best service for your door. Feel free to contact our team - we are just a phone call away. Our professionals are the ones to call when your garage door is acting up. With years of experience working with customers in Beverly Hills, our experts are guaranteed to solve your problem and offer you the best advice around. Contact us today for garage door repair services you can trust. Thank you for choosing our company! Feel free to browse our website for more information in the meantime. Our team at Garage Door Repair Beverly Hills is at your service any time!